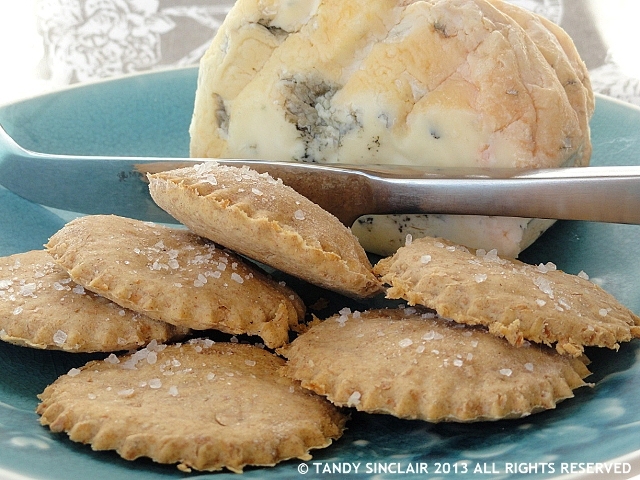 These rye crispbread crackers are pefect with cheese. Even better you can use them with a pâté. Or even to dip into hummus. For April the Fresh From The Oven challenge was set by Jen over at Blue Kitchen Bakes. The challenge was to make Knackerbröd – Rye Crispbread which is literally a crisp bread. Dave and I have a nightly ritual of ending our meal with cheese and crackers. This was a great ‘excuse’ then for me to make crackers instead of buying them. As Jen set a recipe challenge, I am not posting the recipe here. You can head on over to her blog to take a look at it. I am a day late in submitting my post to the linky – and once again I have to lament as the where the month went! I baked the crackers in two batches and decided to add some salt to the top of the second batch to give them a little more flavour. I do not think I will be baking rye crispbreads again but I will turn my hand to making some sourdough crackers in the future. do you have a nightly after dinner food ritual? You will notice that there are no links to posts that I did a year ago! We are usually overseas at this time of the year. We normally take our annual holiday the last week of April and the first week of May as there are two public holidays in South Africa at that time, which means we take less time off work. However, this year we could only get accommodation in May. I am looking forward to my upcoming break and have started counting the days! I am submitting this recipe to Fresh From The Oven which is being hosted this month by Jen. Oops, sorry, meant to leave this on Monkey Bread! The crispbreads look nice – I adore homemade crackers! I totally know the feeling…the picture looks better than it tastes…I like to finish my meals with a piece of creamy chocolate. Do you know, Tandy, I have never even considered making crackers! This recipe is most inspiring. I shall plan them in very soon, I think. Thanks! They were crisp on day one! Love to end my meal with cheese and biscuits but definitely don’t have a ritual!! There won’t be a recipe from me sadly, I was not that taken with them! Love this recipe it’s very different to anything I would have tried!